Former President Francisco Flores will face embezzlement and other corruption charges related to what prosecutors said Wednesday was the misappropriation of at least $5.3 million in loans from Taiwan during his tenure, from 1999 to 2004. The country’s chief prosecutor, Luis Martínez, told a television interviewer that charges had been filed in court against Mr. Flores, who has been summoned to a court hearing on Friday. He has not been seen publicly in several months, but in a hearing in January called by the nation’s Congress, which is also investigating him, he denied any wrongdoing. President Mauricio Funes has said Mr. Flores received $10 million in donations in the final months of his term without accounting for them. Flores also allegedly mismanaged another $10 million that was donated 10 years ago by Taiwan's government during his presidency from 1999 to 2004, according to fiscal crimes prosecutor Tobias Menjivar. Flores is also accused of disobedience for failing to show up for a meeting with a congressional commission investigating what happened with the money Taiwan donated, Menjivar added. Menjivar said Judge Marata Rosales has up to five workdays to set an initial court date for Flores and that it would be up to her to request Interpol's help in arresting the former president, whose whereabouts are unknown. Flores has said he received the money personally from Taiwan and handed it over to the intended state projects. He has offered no proof of the handover. According to La Prensa Grafica, Flores is now in Panama where he is allegedly being protected by that country's president. Ex-president Flores is from the right-wing ARENA party and participated on the campaign team of ARENA candidate Norman Quijano in the presidential elections earlier this year. The corruption allegations became one of the central themes leading up to the victory of the left wing FMLN in March. 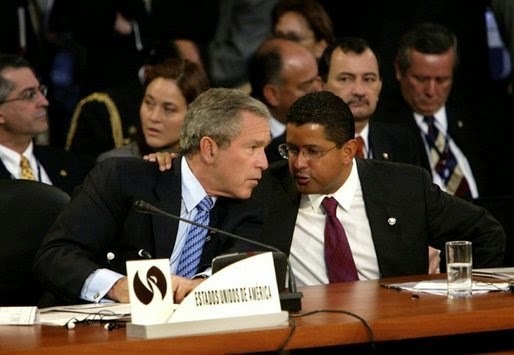 In 2005, the Bush administration in the US backed Flores to become the Secretary General of the Organization of American States. Flores failed to win the post over the opposition of many Latin American nations. Presidents George W. Bush and Francisco Flores in 2004.